The original 1916 film of the “Battle of the Somme” was filmed in the June days leading up to the big push, and then the following two weeks in July 2016. It was the first ever war film. After the footage had been compiled and edited it was shown firstly to the King and Queen, and then the Government. It was then decided to release the film to the public at large to help inspire them as the Great War entered its third year. An estimated 20 million saw the film in 1916. Apparently it was not uncommon for members of the audience to leap up, shouting and pointing to a family member whom they had suddently glimpsed. The film was silent, with about 50 caption slides, and in five reels. The total length was about an hour and a quarter, and there would have been a short break between each reel as the film was changed over. 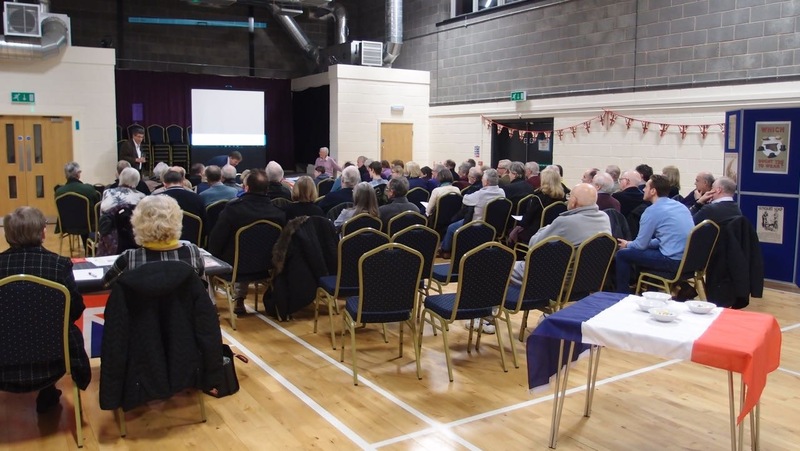 The presentation of the film at Gringley Community Centre on 24th February, 2017, was arranged by the Gringley History Club in conjunction with Nottinghamshire Heritage Forum and Bassetlaw Museum. Sue Clayton from the Heritage Forum, along with Gavin, provided a voice-over for various episodes. An audience of over 6o people attended, and the general reaction was one of surprise at the quality of the filming. Naturally the film was sanitised and without much in the way of close-up. Content was largely given over to scenes of men marching, prisoners being rounded up, casualties queuing, shells being manoavered and fired, and explosions in the far distance. The two commentators argued that the film was unexpectedly level in terms of its tone and presentation, and not purely a propaganda exercise. I am not sure the audience entirely agreed with that assessment, but certainly the film was not an unashamed piece of propaganda. For further pictures please see the SCRAPBOOK page.